minimumValueAngle and maximumValueAngle determine not only the position of the tickmarks, labels and needle, but the direction in which they are displayed around the gauge. For example, if minimumValueAngle is greater than maximumValueAngle, the gauge will be anti-clockwise. Below, there are two gauges: the top gauge has a minimumValueAngle of -90 degrees and a maximumValueAngle of 90 degrees, and the bottom gauge has the opposite. The range between minimumValueAngle and maximumValueAngle, in degrees. This value will always be positive. The background of the gauge. If set, the background determines the implicit size of the gauge. See also Styling CircularGauge's background. The CircularGauge that this style is attached to. The foreground of the gauge. This component is drawn above all others. Like background, the foreground component fills the entire gauge. By default, the knob of the gauge is defined here. See also Styling CircularGauge's foreground. The amount of tickmark labels displayed by the gauge, calculated from labelStepSize and the control's minimumValue and maximumValue. See also tickmarkCount and minorTickmarkCount. The distance in pixels from the outside of the gauge (outerRadius) at which the center of the value marker text is drawn. The interval at which tickmark labels are displayed. For example, if this property is set to 10 (the default), control.minimumValue to 0, and control.maximumValue to 100, the tickmark labels displayed will be 0, 10, 20, etc., to 100, around the gauge. This property determines the angle at which the maximum value is displayed on the gauge. There is no minimum or maximum angle for this property, but the default style only supports angles whose absolute range is less than or equal to 360 degrees. This is because ranges higher than 360 degrees will cause the tickmarks and labels to overlap each other. The default value is 145. This property determines the angle at which the minimum value is displayed on the gauge. The default value is -145. This component defines each individual minor tickmark. The position of each minor tickmark is already set; only the implicitWidth and implicitHeight need to be specified. See also Styling CircularGauge's minorTickmark. The amount of minor tickmarks between each tickmark. The distance in pixels from the outside of the gauge (outerRadius) at which the outermost point of the minor tickmark line is drawn. 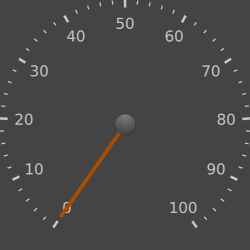 The needle that points to the gauge's current value. This component is drawn below the foreground component. When defining your own needle component, the only properties that the style requires you to set are the implicitWidth and implicitHeight. Optionally, you can set x and y to change the needle's transform origin. 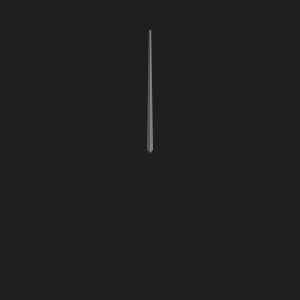 Setting the x position can be useful for needle images where the needle is not centered exactly horizontally. Setting the y position allows you to make the base of the needle hang over the center of the gauge. See also Styling CircularGauge's needle. This property holds the rotation of the needle in degrees. 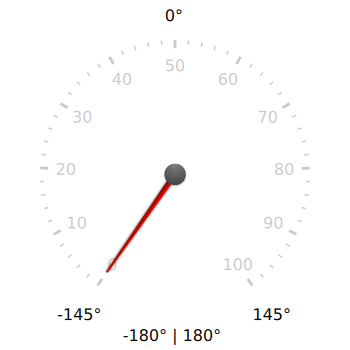 The distance from the center of the gauge to the outer edge of the gauge. This property is useful for determining the size of the various components of the style, in order to ensure that they are scaled proportionately when the gauge is resized. This component defines each individual tickmark. The position of each tickmark is already set; only the implicitWidth and implicitHeight need to be specified. 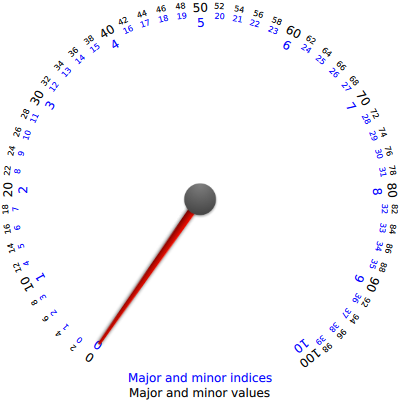 text: "Major and minor indices"
text: "Major and minor values"
The index property can be useful if you have another model that contains images to display for each index, for example. The value property is useful for drawing lower and upper limits around the gauge to indicate the recommended value ranges. For example, speeds above 200 kilometers an hour in a car's speedometer could be indicated as dangerous using this property. See also Styling CircularGauge's tickmark. 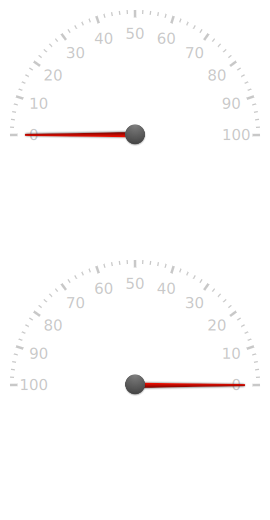 The amount of tickmarks displayed by the gauge, calculated from tickmarkStepSize and the control's minimumValue and maximumValue. The distance in pixels from the outside of the gauge (outerRadius) at which the outermost point of the tickmark line is drawn. See also Styling CircularGauge's tickmarkLabel. The interval at which tickmarks are displayed. For example, if this property is set to 10 (the default), control.minimumValue to 0, and control.maximumValue to 100, the tickmarks displayed will be 0, 10, 20, etc., to 100, around the gauge. Returns value as an angle in degrees. This function is useful for custom drawing or positioning of items in the style's components. For example, it can be used to calculate the angles at which to draw an arc around the gauge indicating the safe area for the needle to be within. For example, if minimumValueAngle is set to 270 and maximumValueAngle is set to 90, this function will return 270 when passed minimumValue and 90 when passed maximumValue.